Android Nougat 7.0 ROM, Nexus 4 CM14/14.1 (CyanogenMod 14/14.1). In addition to CM14.1 ROM we also have the AOSP Oreo ROM for Nexus 4, LineageOS 15 for Nexus 4, Lineage 14.1 for Nexus 4. For latest updates, stay tuned to the Lineage OS 14.1 device list page. We also have the official CM14.1 for Nexus 4, which you can check out. We have update many Android NOUGAT AOSP ROMs and also many CM14/14.1 (CyanogenMod 14/14.1) ROMs updated and many are yet to come. We also have the AOSP Nougat 7.0 for Nexus 4 (mako) and now this CyanogenMod 14/14.1 (CM14/14.1) for Nexus 4 (mako) is brought to you by developer StephanMc. THIS IS AN INITIAL BUILD. THIS MAY NOT BOOT AT ALL OR IF IT BOOTS IT MAY HAVE MANY MORE BUGS THAN YOU CAN IMAGINE. TRY AT YOUR OWN RISK. Installing a custom ROM on a Nexus 4 requires the bootloader to be unlocked on the Nexus phone, which may VOID your warranty and may delete all your data. Before proceeding further you may consider backup all data on the phone. You are the only person doing changes to your phone and I cannot be held responsible for the mistakes done by you. Unlocked bootloader and a custom recovery installed on the Nexus 4. Download and Copy the GApps and Nexus 4 CM14/14.1 (CyanogenMod 14/14.1) ROM ZIP to your phone. Wipe data, Cache, Dalvik Cache and the System partition. First flash the Nexus 4 CM14/14.1 (CyanogenMod 14/14.1) ROM ZIP from device. Then flash the GApps zip from your device memory. 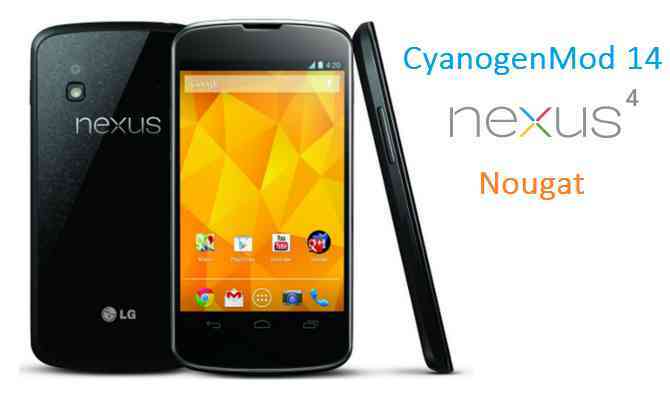 Reboot and Enjoy the Nougat 7.0 ROM CyanogenMod 14/14.1 (CM14/14.1) for Nexus 4. Copy the latest Nexus 4 CM14/14.1 (CyanogenMod 14/14.1) ROM ZIP file to your phone. Stay tuned or Subscribe to the Nexus 4 (mako) forum For other Android Nougat ROMs, CyanogenMod 14 ROMs, other ROMs and all other device specific topics. Development thread for Nexus 4 CM14/14.1 (CyanogenMod 14/14.1) Nougat 7.0 ROM by StephanMc is here. It basically works, but the two most important apps (Telephone and Camera) consistently crash. Admittedly, I did steps d and e in one step (without rebooting into recovery mode after installing CM14). Also, I’m not sure if I understood the sentence “Wipe data factory reset, Cache partition, Dalvik Cache and Format the System partition.” correctly. Well, it basically worked for me – except that the telephone and camera apps crash consistently. Can you try with the latest ROM update and let me know how it went? Also I have updated the “Wipe data factory reset….” sentence to a meaningful one. OK, I tried a second time. This time I rebooted after installing CM14 with TWRP and before installing OpenGApps. And now everything seems to work perfectly. Update: Video recording is not working – neither 1080p nor 702p. I’m not sure if this is related to the ROM, but today I tried making a call over Bluetooth for the first time. It consistently falied with an error message “Kein Netz” (no network). However, making a call without Bluetooth and the Bluetooh pairing DO work. I’m a Java developer, but not on Android. Can I help debugging the video an BT call issues somehow? Hi Henning, can you try the video recording with some third party camera apps?